I am sat here trying to write a book review. Normally these are simple short reviews with me saying in my own way what I liked about the book, how it made me feel and gently giving such critique I feel is honest and correct. I Woke Up This Morning has left me puzzled. As the author knows I am a huge fan of his work. When I started to read this book and by the time I was a third of the way in I was convinced of one thing: It was an exercise in pure self-indulgence and that he has let himself down. I sit here having literally just finished and I realise how wrong I was about that. I think some of the points Stuart is trying to make a little too subtle for a fat, baldy, boorish, ignoramus such as myself. I’ll try to convey what I thought as succinctly as I can. Stuart tells a tale of alienation. A tale of fear and how is it wrong sometimes to indulge ourselves in our woes. We should strive to be a better person by whichever means is best for us. 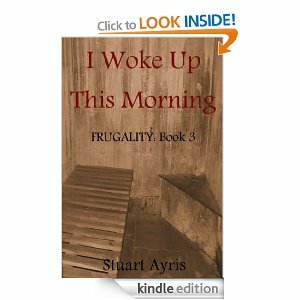 I can’t say how much autobiography is in the novel but you get the distinct impression that the character “Stuart Ayris” has a few regrets. Separating fact from fiction for someone who doesn’t know the author closely is like trying to paint using morning mist so I’m not going to attempt it. With his usual breathtaking brilliance Ayris lays down the positives and leaves his jewels of wisdom for the discerning reader to uncover. When you come across these little treasures you feel better about yourself and better about your day. Stuart’s work is unique in style and structure but my god does it speak to my soul at times. A work of cloudy, confusing genius, yet genius it is.